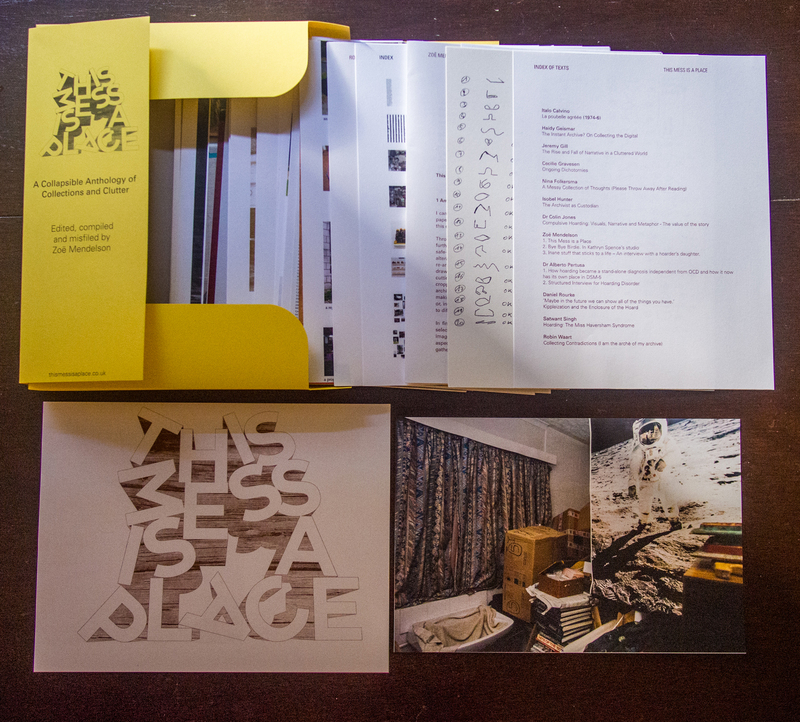 This Mess is a Place, edited/curated by Zoë Mendelson and published by AND Publishing. I have an essay/chapter in This Mess is a Place, a collection on hoarding and clutter, edited, compiled and misfiled by Zoë Mendelson. The book is currently available from the website, with wider distribution to follow from the very wonderful AND Publishing. It includes articles, artworks, interviews and fiction. Alongside This Mess is a Place’s own collaborators from psychiatric and archival fields there are contributions of artistic projects from Jim Bay (UK); Michel Blazy (FR); Carrie M Becker (USA); Marjolijn Dijkman (NL); Nat Goodden (UK), Jefford Horrigan (UK); Dean Hughes (UK); Mierle Laderman Ukeles (USA); Robert Melee (USA); Zoë Mendelson (UK); Florence Peake (UK); Michael Samuels (UK); Kathryn Spence (USA); Tomoko Takahashi; Robin Waart (NL); Julian Walker (UK) and Laura White (UK). The publication contains essays and documents by Dr. Colin Jones (Senior Lecturer/Researcher in Applied Health and Social Sciences, UK); Dr. Haidy Geismar (lecturer in digital anthropology and material culture, US/UK); Jeremy Gill (urban planner and theorist, AUS); Cecilie Gravesen (artist, curator and writer, UK/Den); Dr. Alberto Pertusa (consultant psychiatrist, UK); Daniel Rourke (artist and researcher, UK); Isobel Hunter (archivist and Head of Engagement at the National Archives, UK); Satwant Singh (nurse practitioner and cognitive behavourial therapist, UK); Nina Folkersma (curator and critic, NL); Alberto Duman (artist, writer, UK). A full list of essay titles can be seen here. The publication also includes documentary photography by Paula Salischiker (ARG) and an interview with an anonymous hoarder’s daughter.